This post will help you to know the goat kidding signs. Not much help I know. I sure didn’t think so either. Those first few seasons I pretty much stumbled along with my herd. Guessing on due dates and hoping for the best. To be honest when it comes to kidding that really isn’t a bad way to go about things. Goats have been having babies for thousands of years and if they can get along without a clue as to when those kids are coming then we can too. The problem is most of us goat farmers also have lives. We have families and kids. Soccer practice and girl scout meetings. Things we need to plan for and places we need to be. So, having a basic idea of when your goats are going to have their babies will be a bit more than helpful. 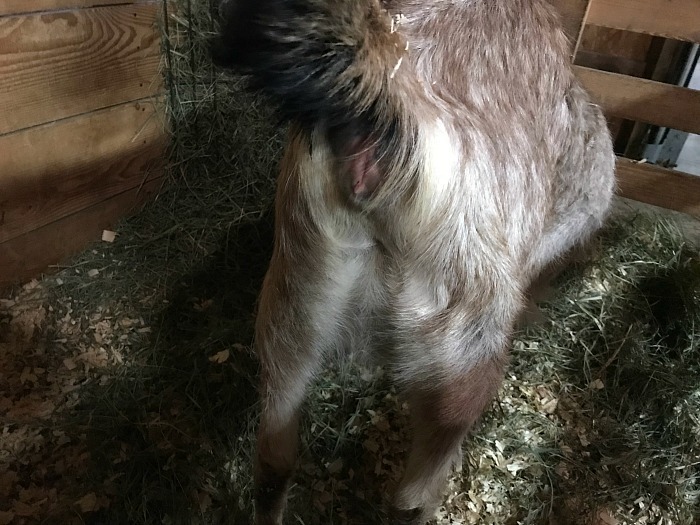 After 6 years of kidding seasons, I have found there are quite a few signs that will warn you that your goats are getting ready to kid. This list is pretty much my own experiences with my own herd. It is not even close to scientific or even a strict rule of thumb. But it is my go-to list for what to look for as kidding season approaches so I can at the very least have my kidding kit and birthing pens all set up and ready to go. 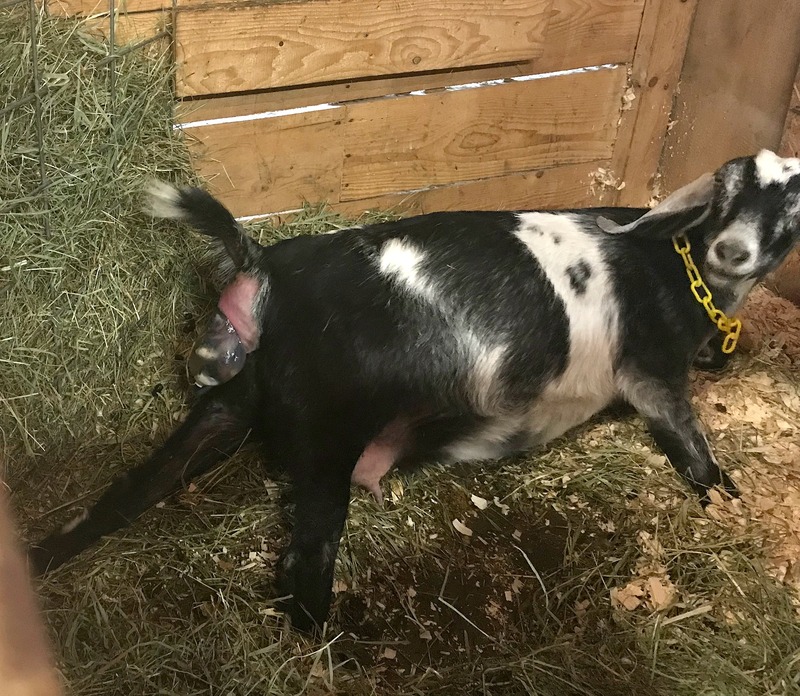 If you want to know just when your goat will be due to kid, you can enter the breeding date here and get your target due date!! 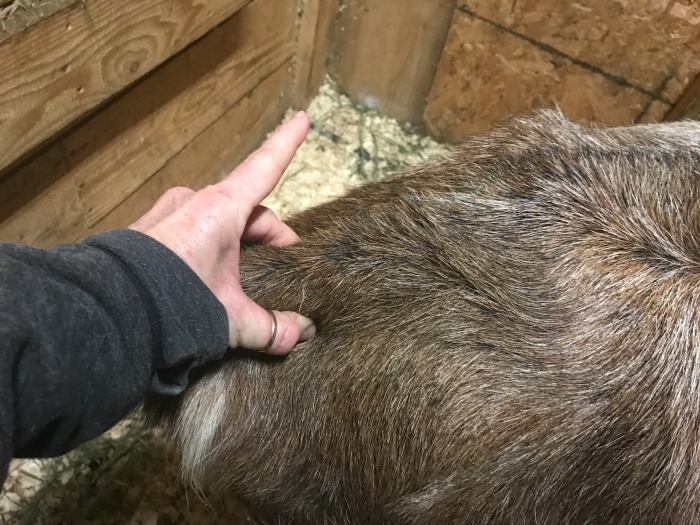 To find the goat’s tail ligaments you want to run your hand down over her spine. As you get close to the tail you will be able to “pinch” the ligaments at the base of the tail. These will soften and continue doing so as kidding approaches. At this point, you should be able to feel them. It should feel like a chord of sorts. You will want to check each doe’s ligaments daily. Just do this whenever you feed, run your hand down squeezing as you go. Just make a mental note of how thin things are. 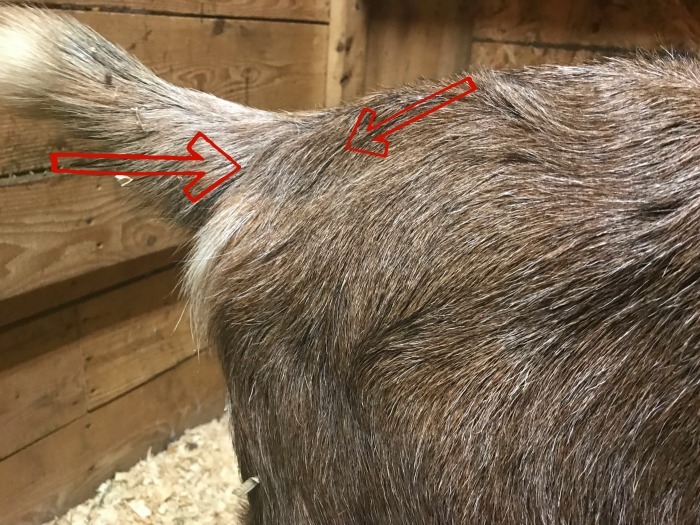 Your goats can begin to form an udder as long as a few weeks out from kidding or just a few hours before. This is where experience comes in handy. The first year you kid, your goat will set the stage for each year following. Keep a good log so you know how soon your doe forms her udder. This log will come in quite handy as a comparison in the following years. This is a tell-tale sign for me. Most of my girls if not all tend to swell up in the back end. The closer the due date is the more swollen they get. This is how their body prepares for labor and the size of the babies to come. The puffier they get the closer they are to kidding. As your doe approaches her due date her babies will drop. You can see this by a slight indentation of their upper belly close to their spine. Just like we do before we have our own children the doe’s kids will drop into position prior to labor. Ninja tip: It is important as time goes on that you watch your herd constantly for any changes in their bodies. I suggest taking monthly or even weekly pictures beginning before you breed. This was a lifesaver for me when I first began breeding my goats. When your girls grow slowly sometimes those changes are hard to catch. With just a few photographs you will know for sure when bellies grow, babies drop, and lady parts get puffy. The next few signs are clues labor is really close and you need to be on high alert. This is mama’s way of talking to her kids. Instinct tells her something is going to happen even if she is not aware what. Nibbling at her side or humming to her belly is a good sign things are getting close. I like to check my doe’s tail ligaments every day. This is just another way for me to be aware of any changes. When your fingers/thumb can just about touch that means those ligaments are gone and babies are close! Another sign kids are close is a hard and sometimes shiny udder. 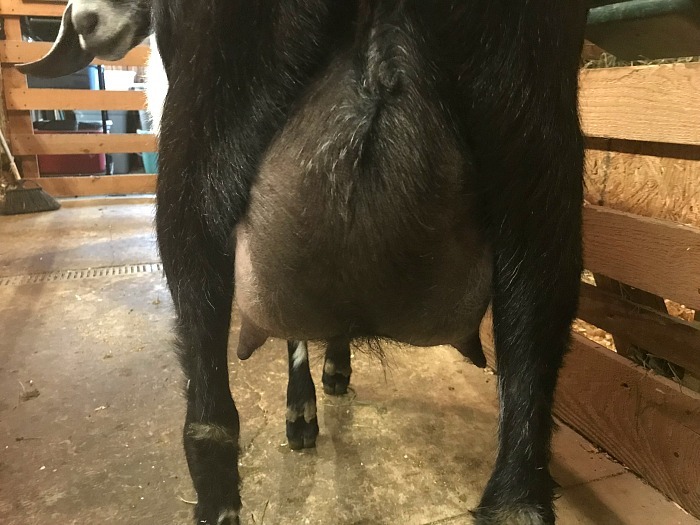 Another place you want to check often is your goat’s udder. This will do two things. 1. 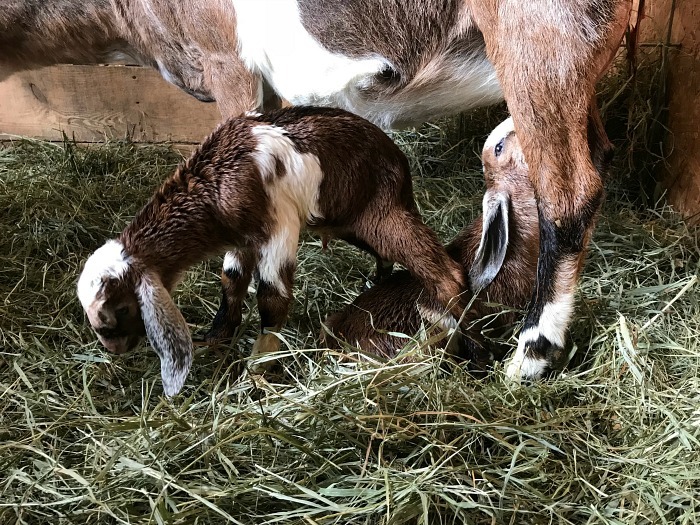 Let you know of any changes in firmness and 2. prepare your goat for milking which can be quite helpful if your goat is a first freshener or skittish. So, before we talked about a swollen back end, now we are talking about very puffy and very swollen and sometimes even red. This again is your doe preparing for the birth and her body doing all that it can to be ready for those kids. At this point, things will be so puffy that it will stick out and will be fully noticeable from the side. These final signs usually happen just hours or even minutes before kidding. 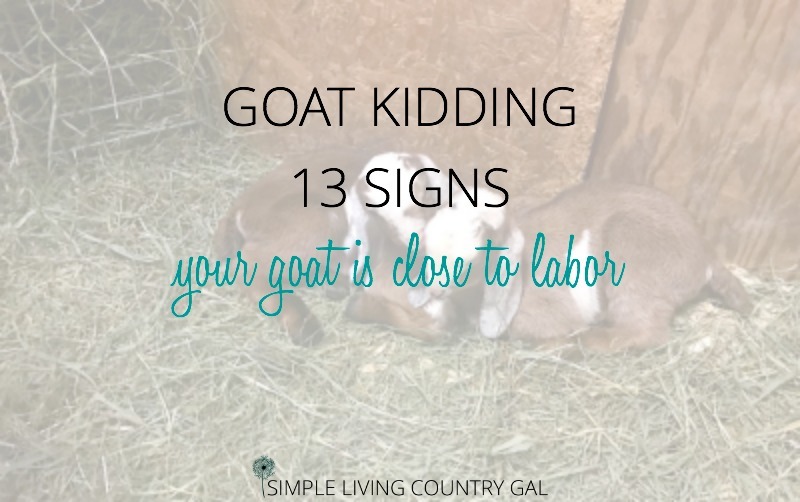 If you see any of these signs get your goat into a birthing pen so she can have a calm private place to kid where she feels safe and secure. Not everyone sees this sign because you really need to be there when it happens. However, a wet tail can also let you know as well. 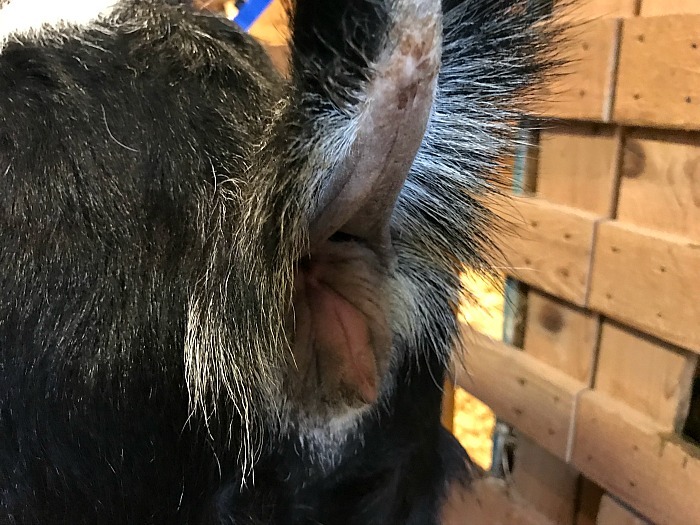 A long thin white string of discharge, a wet or damp tail or even a puddle in your goat’s pen all mean kids will be here very very soon. If your doe is pawing or scuffing the ground, she is just preparing a bed for her and her babies. If you have not moved your doe to a private area now is the time. There is nothing worse than moving after labor begins so better to be a little early than upsetting your doe by moving her after the fact. At the very least have a pen cleaned and ready to go. You know when I heard about this sign I never really understood what it meant. After having goats I totally get it now. My gals will just stare off into space chewing their cud and humming a bit. I relate it to a sort of meditation. Another way they are preparing for what is about to happen. Not all of my does do this but surprisingly most of them do. If your does has her head against the wall you know you are minutes away from kids. This is just a way that they brace themselves during a contraction. I have only had a few does do this so I do not consider this sign a common one, however, I do want you to be aware of it. Heads on the wall mean babies right now. Bonus sign: Another sign that you might notice is your doe peeing quite frequently but not actually doing anything. This is a huge sign that pushing is about to commence!! The most obvious sign is when your doe is pushing. This will begin as a low grunt sound that she may do while standing or laying down. As her labor progresses the grunt will get longer and louder. More often than not labor will happen with your doe lying down but this is not now always the case. There will always be a doe or two that prefers to kid standing up, so listen for the intensity of the push to know just how close things are. Knowing the signs of kidding isn’t necessary but it sure is helpful especially on a small homestead. When room is scarce having a clue or two when a goat is about to kid can keep things from getting chaotic. My advice to you is to have a game plan in place for when your doe begins to kid so you are not caught off guard. Remember your goats whether a first freshener or a third will have the instincts to know just what to do. About 95% of all kidding happens without a hitch, however, there is always a chance that something can go wrong. Here are just a few things to remember before the big day arrives. Have a kidding kit prepped and ready to go. Alert your vet when things get close and let them know you may be calling for help or advice. 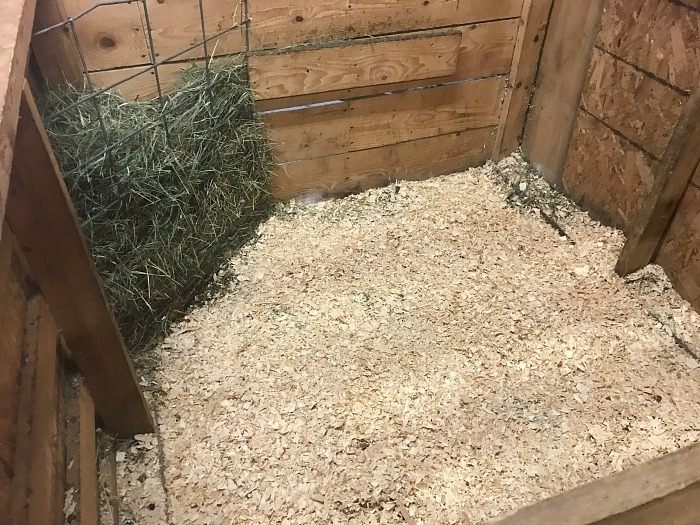 Prepare a birthing stall or a part of your barn or shed that will keep your doe and her kids safe from the elements and other goats. Finally, have your camera ready for some adorable goat kid pictures! Happy and healthy kidding everyone! What if i dont have a birthing pen. I have two pregnant goats in a small pen. As long as they get along and there is room for them to have a bit of privacy in a corner you should be okay. If your goats have access to pasture they may prefer to have them out there. Oh my gosh! I’ve been searching for 2 months to find a layman’s talk website for goat information. I resuecued a pregnant Mama about 2yrs old and her intact son of about 1year old in March. We did a pregnancy check and confirmed she was pregnant but no way of knowing when she was covered (we suspect it to be her son as they were not separate). 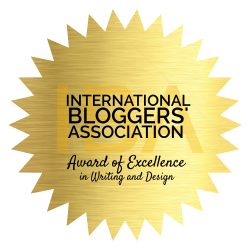 Finding your website is a God-send! Thank you so much. I am glad you found me too! Welcome to the crazy awesome world of goats. Keep the checklist and refer back to it to help pinpoint better the time she is due. I would prepare a kidding pen at least a month out, just in case.